How to Recreate 13 iPhone 3.0 Features Right Now! The 3.0 iPhone software update Apple announced earlier this week is set to bring more than 100 new features. But the free update will also make obsolete many paid applications in the App Store, including ones that are in high demand now. Voice recording and notes applications in Apple's App store are among those that will take a major blow once the 3.0 iPhone software update is launched this summer. Many of them will disappear once they get replaced with Apple's own built-in apps. 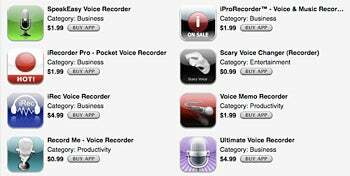 Apple's App Store for iPhone hosts at the moment more than 50 applications that allow you to use the iPhone as a dictaphone. Few of them are free, with the vast majority ranging in price from $0.99 to $4.99. However, the iPhone 3.0 update will bring a built-in voice notes application, allowing users to record voice notes (interviews, lectures, etc.) and then share them over e-mail or the upcoming MMS feature. Another endangered species in the App Store will be the notes apps. Currently, about 35 applications allow you to take notes on your iPhone or iPod Touch, either using a landscape keyboard or offering synchronizing options. These range in price from free up to $9.99. But the improved Notes app coming in the 3.0 update will allow users to compose notes using a landscape keyboard, or by copying, cutting, and pasting from other apps and will sync them using iTunes. Dictaphone and notes apps aren't the only apps that will become obsolete, though. With the 3.0 update bringing MMS features, additional applications offering this kind of functionality (around 10) are set to vanish. Contact card sharing apps are deemed to suffer the same fate too, with the 3.0 OS allowing users to share contacts (two-way) directly over SMS or e-mail. Of course, some iPhone app developers might not be very happy with losing the revenue stream coming from the soon-to-be-useless apps mentioned above, but for the users, the 3.0 update will certainly bring value (free for iPhone, $10 for iPod Touch).